What kind of spin can flexible packaging put on the "circular economy"? For years, sustainability has become an increasingly important aspect of packaging. The latest significant development in sustainability has been the concept of the circular economy. As applied to packaging, simply put, this involves planning every aspect of packaging—materials, design, conversion techniques, distribution, use and recovery—with an eye toward minimizing consumption of materials and energy, and maximizing reuse. 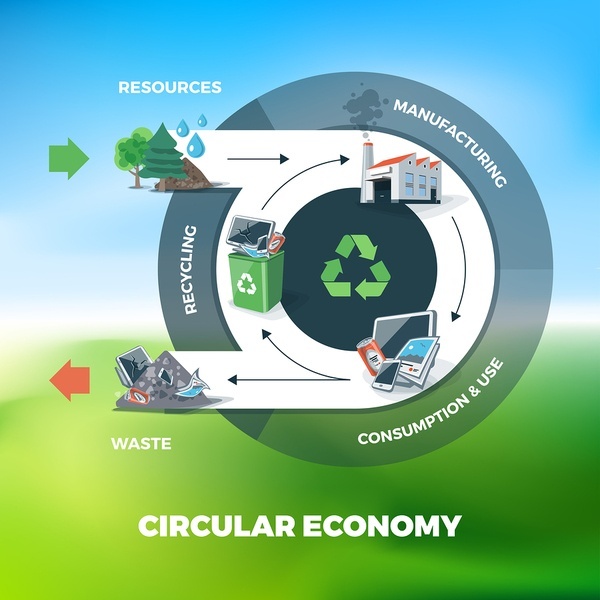 To be truly effective, a circular economy requires participation by everyone in the supply chain, including: packaging materials suppliers, converters, product manufacturers, retailers, consumers, and recyclers. With flexible packaging, especially for food, users face a unique set of challenges in participating in the circular economy. One of the biggest such challenges is that in most cases, truly closed-loop recycling—i.e., making food packaging into more food packaging—is not an option. With few exceptions, Food and Drug Administration regulations prohibit recycled material from being used in food-contact packaging. Even if recycled material could be used for food, flexible packaging has some inherent disadvantages. Many flexible films used for food consist of multiple layers of different polymers, such as polyethylene terephthalate (PET) and ethylene vinyl alcohol (EVOH). Recycling different polymers together is impossible when, as often happens, they have incompatible molecular structures. Also, most recycling centers are not set up to process flexible packaging; their machinery can only handle rigid plastics. However, bulk flexible packaging, such as intermediate bulk containers (IBCs) and bag-in-box, has a big advantage when it comes to the circular economy—and its manufacturers and users are in a position to minimize or overcome its disadvantages. A major aspect of the circular economy is energy consumption. A big part of that is minimizing fuel used for transportation, by cutting down on distances—and weight. The latter is an ongoing, inherent advantage of bulk flexible packaging. It is lighter and takes up less space than almost all rigid bulk packaging alternatives, meaning that more product can be delivered per tankload of fuel. And because it is almost always one-way packaging, there are no transportation return costs. IBCs are used almost exclusively for industrial applications. In the food sector, this means delivering bulk loads of liquid, semi-viscous, or powdered ingredients to food processing plants. (Bag-in-box often is also used this way, to deliver smaller loads.) This means the supply and return chains can be more tightly controlled than with consumer products. It is therefore easier for suppliers and their industrial customers to make sure that used flexible packaging gets collected and delivered to a recycling facility that is equipped to handle it. When the flexible material is monolayer, or consists of multiple layers that are chemically compatible, recycling is relatively straightforward. Even some film structures that comprise incompatible materials can be processed with a "compatibilizer" chemical such as DuPont's Fusabond. Because of FDA regulations, most resin recycled from flexible material cannot be processed into material intended for food contact. However, it will be available for non-food end uses such as shipping bags, sacks of fertilizer and other farming/gardening materials, newspaper bags, etc. This does not quite close the circle perfectly, but it comes much closer to the "circular economy" model than simply landfilling the discarded material. For more information about smart flexible packaging choices, download our Bag-In-Box brochure today.